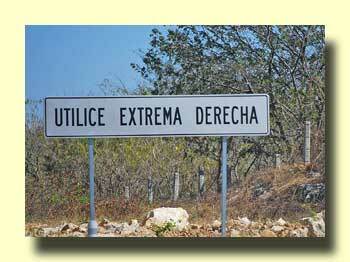 Just south of Tehuantepec is one of the windiest places you're ever likely to drive through in an RV. In our book we warn RVers to tie their awnings down well before heading south from Tehuantepec, and for good reason. 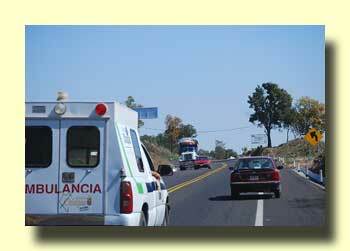 A few years ago an RVer in a new coach started south from Tehuantepec one morning and ran into wind. Before he knew it the wind had unrolled his furled awning and he stopped along the highway to try and stow it again. When he opened his coach door the wind entered and the pressure pushed out his front window (it departed toward the south) and also pushed out the top of his slide (the bottom was apparently locked). The Green Angels came along and tied everything down with ropes and he limped back to Tehuantepec - where he waited ages for a new window to arrive from the States. It never did, so eventually he drove back in his tow car and brought one south. Anyway, the wind no longer goes to waste. There's a good-sized wind farm (25 windmills) here now. 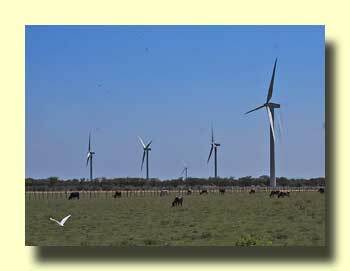 A recent article in The News says that there will soon be 167 wind turbines here producing 250 megawatts of electricity. If you want to keep up on Mexico news you might try the web edition of The News. It's in English and is a well-designed and fast-loading site. The Wall Street Journal could take lessons. I believe it's the slowest loading newspaper site in the world, but that's another story. 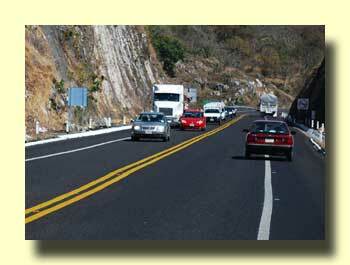 We drove the new toll road from Tuxtla Gutiérrez to San Cristobal today. What an improvement over the old free road! It climbs from 1,500 ft. to 7,300 ft. in 26 miles so the route is still a challenge for big RVs, but it's much better than the old road. There's only one toll booth, and it's near the lower end. There's a picture of the rates below. This is a two lane road with wide shoulders. Signs direct you to drive on the shoulders to allow other vehicles to pass. You better pay attention ahead because there's some really slow traffic which will force you toward the center - and the guys coming down the hill are likely to be in the center too! There are a few interesting photos below. 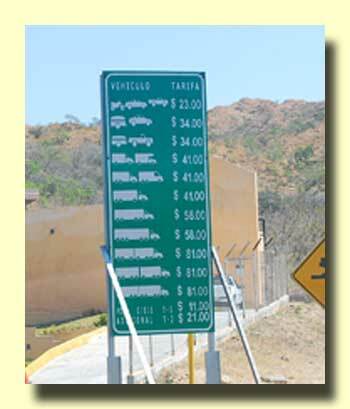 Toll Rates for Cuota from Tuxtla Gutiérrez to San Cristobal - rates in pesos. That truck ahead on the right is only moving about 15 mph. If the vehicles aren't too big!